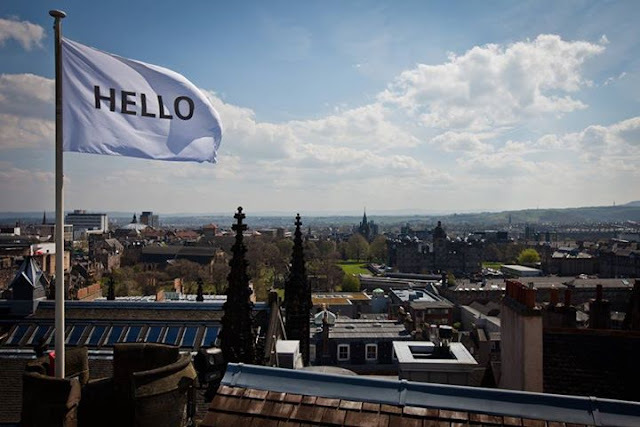 Very much responding to the idea of dialogue in the city, English artist Peter Liversidge has invited anyone in the city with a flagpole to fly a flag exclaming the word 'Hello' (pictured top). Flying for the month of August, when Edinburgh's population mushrooms, the flags flying in more than 20 locations connect visitors and residents and visualise a conversation across the city. 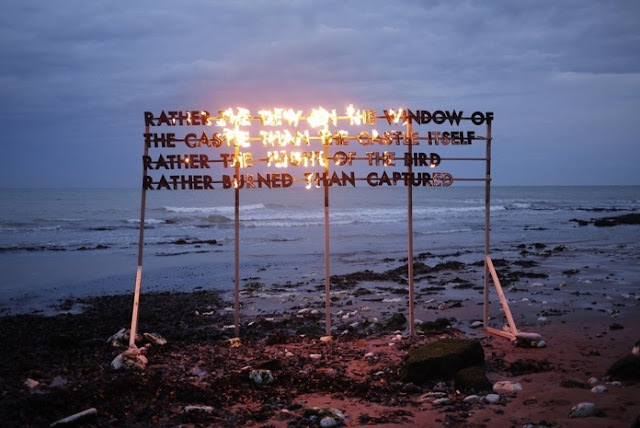 Scottish artist Robert Montgomery has installed sculptural poems in various locations (Kent Fire Poem pictured above) and for EAF he will set fire to one on The Mound on 1 August. Made of oak and taking inspiration from a number of focal points and past experiences, its charred remains will stay for the duration of the festival. Devised by Finnish artists Tellervo Kalleinen and Oliver Kochta Kalleinen, the Edinburgh edition of the project sees composers Daniel Padden and Peter Nicholson work with the citizens of Edinburgh to develop a Complaints Choir for the city, giving residents the opportunity to voice their issues with the place they live. I'm curious to hear how predictable or surprising their range of complaints might be. West of the city centre lies Jupiter Artland, a sculpture park filled with a growing collection of permanent commissions and temporary installations. Two such temporary pieces showing as part of EAF are Scaffold by Sam Durant - a wooden structure visitors are invited not just to view but to view surroundings from it by climbing all over it - and Steam Powered Internet Machine by Jeremy Deller and Alan Kane, aiming to connect the industrial and digital revolutions. Deller, who's currently representing Britain at this year's Venice Biennale, will also present a performance of British indie hits played by Steel Harmony, a Caribbean steel drum band on Saturday 3 August. Though you can see them any time, it's worth pointing out that past editions of Edinburgh Art Festival have brought permananet commissions to the city. 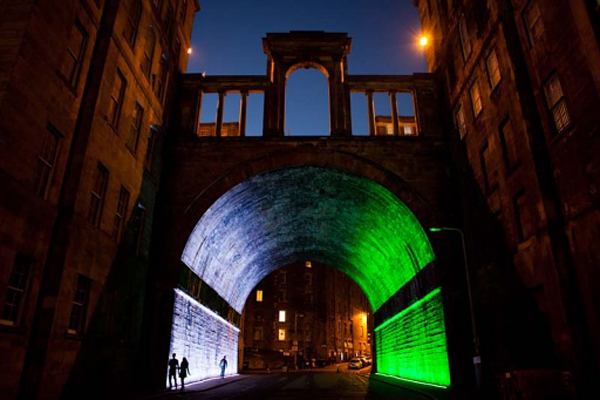 One such commission is the Scotsman Steps, while another is Callum Innes' simple but striking light piece under the Regent Bridge (above). Check out where to find the others on the Festival's website to see the lasting mark EAF leaves on the city.